The signs tell the story. 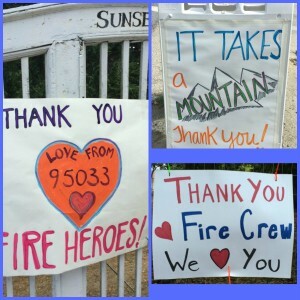 We are so grateful and indebted to the 2000+ firefighters and emergency responders who have worked to protect our beautiful mountain community during the devastating Loma fire. We appreciate the concern of our many wine club members and winery friends who have checked to be sure that we are OK. While Villa del Monte Winery and our neighboring Summit Road wineries are all fine, there are many people in our community who are not so fortunate, especially further up Summit Road in the Loma Chiquita and Casa Loma neighborhoods where houses, possessions, and memories have turned to ash. If you are interested in helping, you can make donations to either the Loma Prieta Community Foundation or the Casa Loma Volunteer Fire Association, both are registered 501(c)3 charitable organizations. Thank you again for your concern. And a big shout out to the amazing, dedicated, and hardworking fire crews—you rock!